Constantia Uitsig is one of those very special places that are probably unique to the City of Cape Town. It's a wine estate producing world-class wines located just 20km from the city, centrally positioned on the peninsula and surrounded by the southern suburbs where we are lucky enough to live. It was originally part of the Groot Constantia Estate and the present homestead dates back to 1894. The farm, now owned by the McCay's, is a favourite spot amongst locals as well as visitors to our wonderful city. It offers a luxury hotel, a spa, three world-class restaurants, stabling for horses, a private cricket oval and a rural atmosphere enhanced by breathtaking views of the vineyards stretching across a valley to the distant mountains in the middle of the bustling southern suburbs. On a recent public holiday we took the short 15-minute drive from our home to the River Café,located on this magnificent estate, for a sumptuous breakfast. The River Café and adjacent wine shop have a continental café or bistro vibe with a large outdoor terrace under trellises decked out,at this time of year, by fragrant star-jasmine creeper. It offers different breakfast and lunch menus comprising a smallish but appealing selection of well prepared dishes. The breakfast menu offered omelettes, eggs Benedict, a traditional English breakfast of eggs, bacon, chicken or pork sausage, mushrooms, tomato,toast and marmalade, a breakfast grill which added fillet steak to the English breakfast, scrambled egg, and a modest selection of similar offerings. The food is well prepared and the helpings generous without being overdone. Carol chose a smoked salmon omelette, which she declared delicious. I ordered the traditional breakfast and found it perfectly prepared and very satisfying. The meal came with toast and a selection of marmalade and jams. We finished off with two delicious, frothy, cappuccino coffees.The bill was a reasonable R210 including the tip. 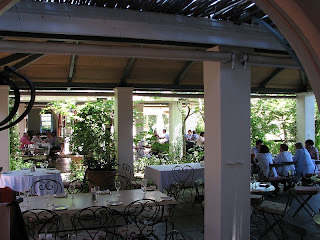 This was our first visit to the River Café, although I was a guest at another Constantia Uitsig Restaurant, La Colombe, a couple of years ago. The River Café is a very different restaurant in a very different price bracket and we both agreed that another visit is a must. It may even become a family favourite! Gosh Bryan, I think you should start a permanent restaurant blog. Does the River Cafe know about this? Thanks for your words of encouragement Liz. I doubt that I will be starting a restaurant blog anytime soon. It is only at the year-end, when work pressures ease up somewhat, that there is time to indulge in more pleasurable pursuits. Also, when Carol started “The Art of It” we planned to cover any kind of art that appealed to us and the culinary art is one of those. It is our chance to enjoy and comment on some of the creations of others in a field quite different to ours. I hope to add a few more posts on some of the other eateries we have enjoyed recently so if it appeals to you keep watching this space!